Alexander Wheelock Thayer's Life of Beethoven. has long been recognized as the classic biography of Beethoven. "Thayer, with his calm and logical mind, scrupulous, magnanimous and spacious...had set out to describe for posterity the great man as he was and lived...and his patient realism and all but inexhaustible industry had created an irreplaceable and masterly portrait." So Van Wyck Brooks described this monumental work of the 1880's. Thayer talked with Beethoven's surviving friends, gathered anecdotes, and sifted hundreds of documents. The resulting wealth of detail stimulated other students, and a mass of Beethoven scholarship appeared. 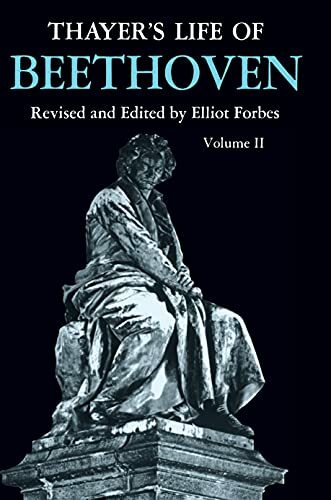 Now Elliot Forbes, one of the foremost Beethoven scholars of our time, has used this new material to bring the Life up to elate without sacrificing Thayer's text.